Margate is fun and vibey, but still manages to retain a kind of seaside village charm. This town is on South Africa’s east coast, at the southern tip of the KwaZulu-Natal Province. In fact, it is more of a seaside resort, as the vast majority of the homes are holiday homes and accommodation for the tourists that flood here every year to make the most of the gorgeous weather, serene coastal forests, and spectacular beaches. It is these beaches that are the main attraction to Margate. A number of these have qualified as Blue Flag Beaches, which means that they adhere to very strict criteria. These include safe swimming conditions, educational information provided, an excellent code of conduct at all times, lifeguards, safe access, and more. These and the other beaches make Margate a hotspot for water sports; including stand-up paddling (SUP), kayaking, body-boarding, surfing, kite surfing, hydrofoiling, snorkelling and SCUBA diving. There are coral reefs that are occupied by beautiful tropical fish, making snorkelling particularly rewarding. Margate Beach is one of the Blue Flag Beaches here and is a favourite for families and friends. It is characterised by coconut palms, rolling sand dunes, and inviting golden-coloured sand that is ideal for playing games, sun-tanning and strolling. Little ones love the water park and swimming pools, and the Margate Lagoon is fabulous for paddle-boating and canoeing on the calm waters. This beach is lined with outdoor cafés and restaurants that are perched right on its doorstep, with lovely views of the sea. Every year, between July and December, Margate and its surrounds are visited by migrating whales (southern rights, humpbacks and orcas). These are easily visible from the shores, and are always exciting to see as they pass by in silent majesty. It is the perfect base from which to explore the Hibiscus Coast. This stretch of the South African coastline is a scenic retreat from the ‘real world’, where stunning beaches await weary travellers and thousands of colourful hibiscus flowers bloom brilliantly, putting on a show for the senses. The Hibiscus Coast includes the towns of Port Shepstone, Hibberdene, Shelly Beach, Port Edward, Uvongo, and (of course) Margate. This is also where the annual Sardine Run takes place, when millions of sardines migrate past this area, attracting dolphins, sharks, birds, and other predators and ensuring a fantastic display for onlookers. Margate is well-equipped for its small local population and the many visitors that frequent it. There are restaurants, shops, hospitals, schools, and even some nightclubs; and the variety of accommodation options is impressive. It is only a little over an hour’s drive from Durban, which is home to the King Shaka International Airport. Visitors that love wildlife have a few choices in Margate. 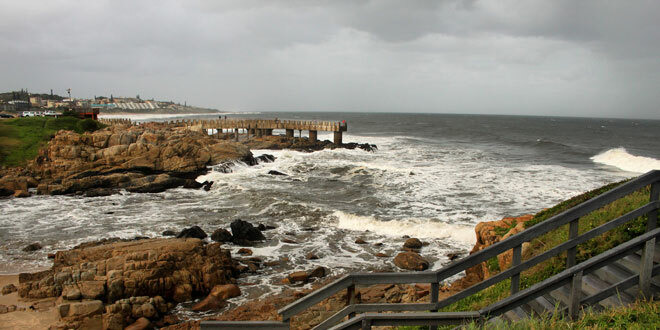 There are a number of reserves in and around this town; which include the Riverbend Crocodile Farm (in Southbroom), the Crags View Wild Care Centre (Port Edward), Pure Venom Reptile Park (Shelly Beach), and Crocworld (Freeland Park). The Margate Country Club – this 18-hole course boasts gorgeous scenery and excellent water features, as well as a Halfway House with a bar and restaurant. The South Coast Birding Route – this incorporates a number of different habitats along the South Coast of KZN and keen birders can look forward to seeing many of the more than 550 species that have been recorded here. These may include the rare blue swallow, bearded vulture, mangrove kingfisher, Knysna woodpecker, magpie mannikin, Narina trogon, forest buzzard, black sparrowhawk, Knysna turaco, and African crowned eagle. Butterfly Valley – situated in Ramsgate (8 kilometres from Margate), visitors to this farm can look forward to seeing an exquisite array of butterflies and learning about them in detail.